The vineyards and cellars of Champagne Henriot in Reims in Champagne. Joseph Henriot studied agronomy in Paris in the 1950s and began working for his family’s Champagne house (Henriot – founded in 1808) at age 21 when his father died in 1957. He became president in 1962. In 1975 while at Henriot, he bought Champagne Charles Heidsieck and ran it until it was bought by LVMH (Louis Vuitton Moet Hennessy) in 1985. As a member of the board at LVMH, Henriot was appointed head of Veuve Clicquot. 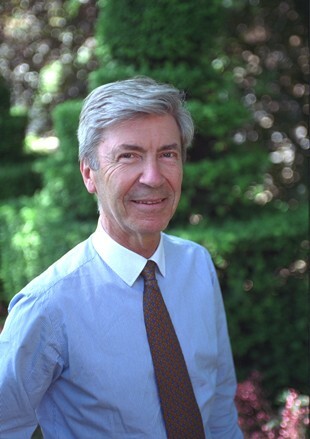 In 1994, Henriot bought back his family Champagne house (Henriot) from LVMH and became president of the company. As his vineyard contracts with Clicquot expired, the family vineyards came back to build the production of Henriot. 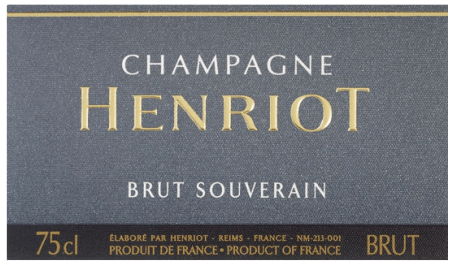 Joseph Henriot created Brut Souverain as the statement of the style of his house. A methode champenoise blend of 50% Chardonnay (mainly from the Cote de Blancs) 45% Pinot Noir (mainly from the Montagne de Reims) and 5% Pinot Meunier blended with a whooping 30% reserve wines*, aged 42-months on the lees (en tirage), and finished with a dosage of <0.8% sugar. Gold-straw colored and fully sparkling; dry, medium-bodied with refreshing acidity and scant phenolics. Supple, richer but still fresh style with LOTS of ripe citrus and a bit of red fruit. Good toastiness (from the long aging on the yeasts) and mineral (from the excellent terroirs) and a bit of spice. This is an expressive, flavorful style of Brut NV that can handle an array of foods ranging into fowl and game. BearScore: 93. 100% Chardonnay mostly from grand cru and premier cru vineyards blended with 40% reserve* wines aged 54 months on the yeasts (en tirage) and dosed to <0.8% sugar. Medium gold straw color and fully sparkling; dry, medium-light-bodied with fresh acidity and scant phenolics. Fresh and focused with lots of riper citrus and plenty of toast over a focused mineral base. complex, compelling, delicious. One person can finish a bottle and want another glass. BearScore: 94. The base blend is 40% Chardonnay, 50% Pinot Noir and 10% Pinot Meunier. This is blended with 35% reserve wines* and 12% darker Rosé (almost light red) wine, aged 36 months en tirage, and given a dosage of <0.9% sugar. Salmon color and fully sparkling; dry, medium-light-bodied with freshly balanced acidity and medium-light phenolics. Delicious if delicate rosé with almost sweet red fruit, citrus, and a hint of spice. YUM. Aperitif style of Rosé. BearScore: 94. *Each of the three wines above contain an unusually high percentage of “Reserve Wines.” Reserve wines can mean a couple of different things in Champagne. In this case, it means a long-aged annually-refreshed blend of wines kept in cuves that carry a house style and the terroir of the houses cellar. Some of the “cuves” containing reserve wine can go back several decades. Amongst the reserve wines in each of the above wines is a small percentage from Cuve 38 which, as you can read below, is a very special cuve indeed. The rest of the wines drawn annually from Cuve 38 go into a special magnums-only bottling of the same name. “Its dosage of less than 5g/l gives full rein to the aromas of its terroir. It is a beautiful pale yellow with golden highlights and a gently efferevescent mousse, leading into a bouquet of fresh butter and white flowers. Cuve 38 also reveals both mineral and slightly creamy notes underpinned by hints of liquorice. On the palate, its richness is elegant and there are flavours of citrus and ripe apricot. Finally, the wine delivers elements of both honey and viennoiserie, redolent of the Henriot style. 100% Chardonnay all from Grand Cru Vineyards fermented using Methode Champenoise from all Reserve (solera) wines bottled in Magnum only with a less-than-0.5% sugar dosage. Pale-gold-straw in color and fully sparkling; dry, medium-full-bodied with freshly balanced acidity and scant phenolics. Deep dense, unique wine. Pure expression of Chardonnay and chalk, mineral and yeast but most of all development. The wine evolves in the glass as if slowly flattens and warms. It really succeeds as wine, not just as sparkling wine. My first impression score was 94+. Three hours later it was 97. Two days later (the still 2/3s full magnum stored cold and tightly stoppered) it was 100. This is stunningly good, utterly unique Champagne that almost demands decanting to help it develop in a reasonable time. Or you could keep it for a few years and then … WOW! Only 2 magnums of this utterly unique, all reserve-wine cuvee are available only and only at Spec’s at 2410 Smith Street in Houston.